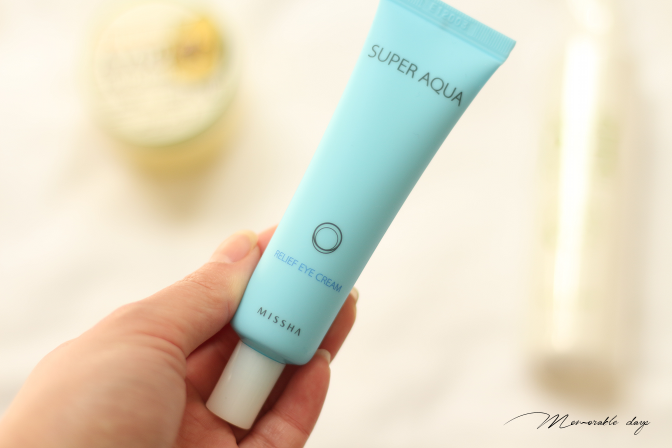 Review: Missha Super Aqua Relief Eye Cream | Memorable Days : Beauty Blog - Korean Beauty, European, American Product Reviews. Hi all! I hope you are having a lovely day. You might have seen my haul from LoveMyCosmetic.de a while ago, if not click here for my haul so you can see which products I got from that shop. 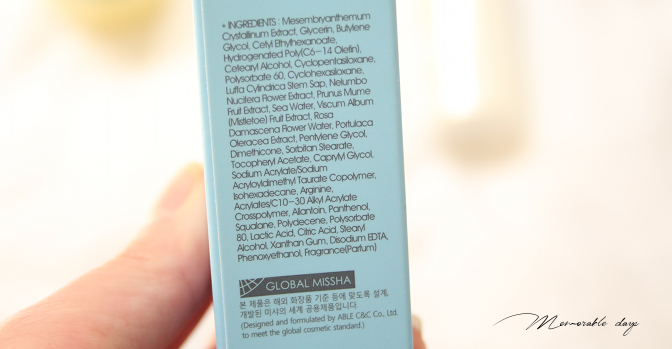 It's a webshop in Germany that sells Korean beauty products. I am always happy to see that the amount of Korean shops in Europe is expanding! 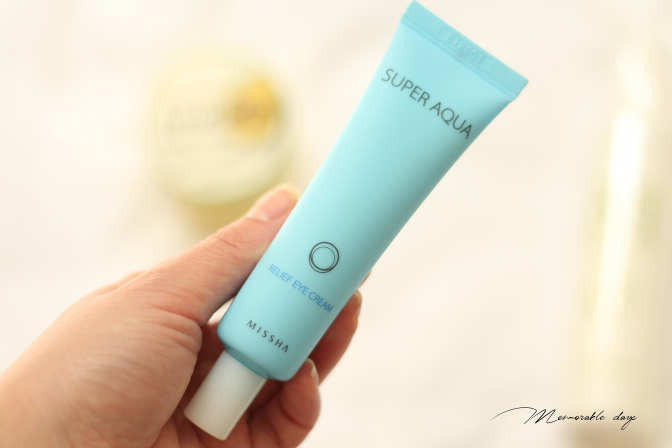 In today's blogpost I will be reviewing the eye cream from Missha of their Super Aqua line. 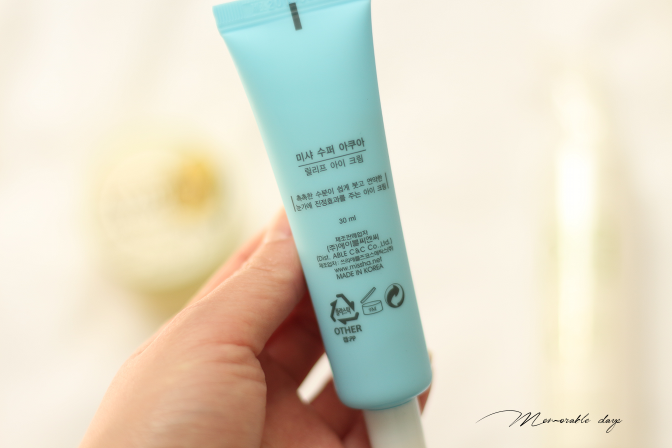 If you got sensitive skin, look no further, this will be a great eye cream for you! 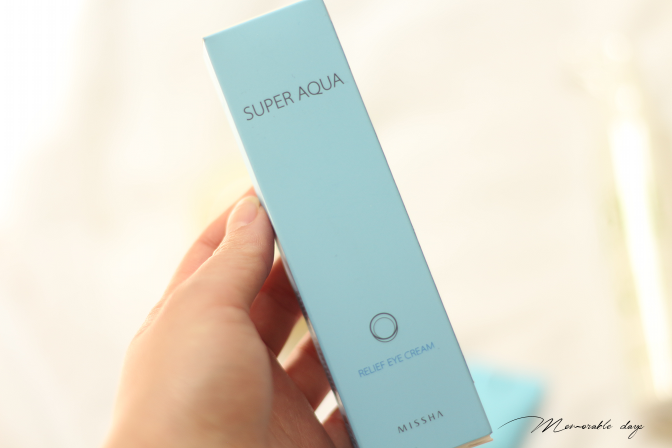 The Super Aqua basic series is formulated with Active Water System to help improve and maintain skin’s healthy moisture balance, making skin moist and radiant. This gentle eye cream is for the delicate and sensitive eye area. It contains Ice Plant Water, Blue Lagoon Water, Mineral Water, and Damask Rose Water instead of regular water to better soothe and hydrate your dry skin. 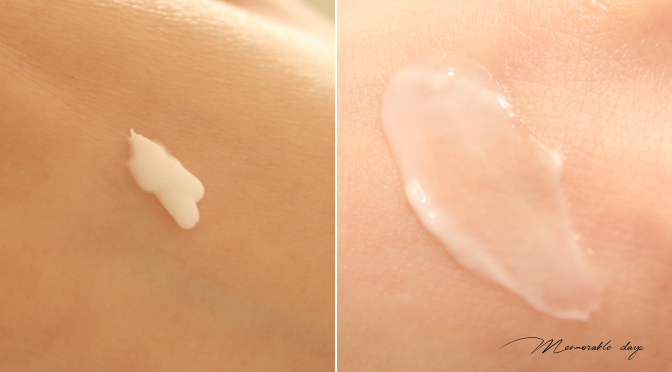 The Eye Cream absorbs quickly and retains the moisture in your skin. It contains 30ml of product. It comes in a blue packaging that fits with the whole Super Aqua basic line. It has English as well as Korean descriptions. You can easily squeeze the product out with the amount that you prefer, which I love about this packaging. You can also find the ingredient list at Cosdna.com to see which ingredients might irritate your skin. Mesembryanthemum Crystallinum Extract, Glycerin, Butylene Glycol, Cetyl Ethylhexanoate, Hydrogenated Poly(C6-14 Olefin), Cetearyl Alcohol, Cyclopentasiloxane, Polysorbate 60, Cyclohexasiloxane, Luffa Cylindrica Stem Sap, Nelumbo Nucifera Flower Extract, Prunus Mume Fruit Extract, Seawater, Viscum Album Fruit Extract, Rosa Damascena Flower Water, Portulaca Oleracea Extract, Pentylene Glycol, Dimethicone, Sorbitan Stearate, Tocopheryl Acetate, Caprylyl Glycol, Sodium Acrylate/ Sodium Acryloyldimethyl Taurate Copolymer, Isohexadecane, Arginine, Acrylates/C10-30 alkyl acrylate crosspolymer, Allantoin, Panthenol, Squalane, Polydecene, Polysorbate 80, Lactic Acid, Citric Acid, Stearyl Alcohol, Xanthan Gum, Disodium EDTA, Phenoxyethanol, Fragrance. After essence and before emulsion, get an appropriate amount and gently apply onto eye area. I usually use an extremely small amount since not much is needed. I like to dap it on with my ring finger. I think this tube will last me forever lol. It has a smooth texture, very easy to apply and is lightweight. It's not sticky and it feels moist on the skin. It takes a few seconds to sink into your skin, so you can easily move on with your eye makeup if you plan to use this in the morning. It has a light creamy fresh scent to it, which is not overwhelming at all. Be careful that you don't apply this in your eyes, since it will sting because of the small amount of alcohol and acids that's included in this product. This was send to me by the webshop LoveMyCosmetic.de, they currently only have a German website. They sell the eye cream for €15,95.-, excluding shipping cost. I am loving this eye cream a lot. It's gentle, goes on smoothly on my eyes and it's great for my sensitive eyelids. It feels moist afterwards, non-sticky nor greasy. The scent is light and fresh, which I prefer. The less scent a product has, the happier I will be. This product does what it says, it gives your eyes moisture and that will stay during the whole day. If you are in your 20s it's important to apply eye cream to keep your eyes moist to prevent fine lines. The price is affordable and the amount of product that you get is a lot. A little really goes a long way. This eye cream gives and retain moisture, but it doesn’t do anything for dark circles or wrinkle care. So if you are searching for that, I wouldn't recommend this product. If you are in your 20s and don't have fine lines yet, start using an eye cream like this one to keep your eye area moist. note: this product was send to me for review purposes, but this didn't affect my opinion about the products, see disclaimer.